Heightened by the immaculate beauty and debonair colors, decorative lamp work beads enrapture the feelings of everyone. With rich industry experience & knowledge, we have been able to provide the best array of Hand made Lamp Work Glass Beads. We are the leading Manufacture supplier exporter of Oval Shape Lampwork Glass Beads and offer this product as per client requirments and this product made by our expert with the great quality and i am looking for bulk order with foreign query . 8x10mm Oval beads can be used in combination with other shapes beads and can also be used as a spacer beads in the jewelry to give more better looks. Simple oval beads necklace is more elegant. Approx 1000 Pcs. in a 1 Kilogram. We are Manufacturer and exporter of Fancy Lamp Worked Beads. These are high quality handmade lamp worked glass beads. Available in many colors. One particular type of glass beads known as lamp work glass bead is very famous. Glass beads provide with the benefit like cost effectiveness and impressive appearance. It is widely used for wearing as bracelet, hears ornaments and often used as decorative items. Bumpy beads are the beautiful beads gaining attention of lots. 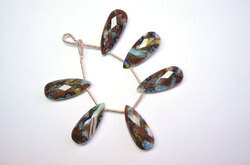 We sell lampwork glass beads done with a range of minute yet beautiful work over beads. 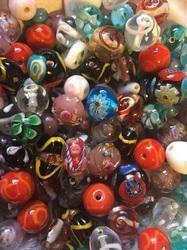 Premium quality lampwork beads are available in different shapes, sizes and designs. Price: US$ 10.10. For 100 Pcs Min.Order: 300 Size: #855 - 12x17mm Product Detail: Flat Square silver foil with multy colour - 280 Pcs / Kg.